The days are starting to be longer, hotter and sweatier. So it all the more important to have products that you know will help keep your face free from those pesky beads of sweat and irrational spots that always seem to appear when the sun pops out from behind the clouds. I recently went to Lush and got a haul going on of products that I feel are ideal for this weather. Kalamazoo is an absolute saviour for your beard and face during the hotter summer months. This cleanser contains a mixture of Cupuacu , Apricot Kernal and Jojoba Oil to to provide your beard with a soft to the touch beard. It also contains Pineapple Juice, which active enzymes help to leave your face feeling fresh, cleansed and dirt free. I've picked this up a few times and even when I've had breaks to try a different product, I always come back to it. This has been the first time that I've used the Tea Tree Toner Water from Lush, but I honestly don't think I could have picked a better time to start using it. This has been a great product to use when it comes to fighting previously mentioned spots that the sun has caused recently, especially if like me you have oily skin. The Tea Tree is perfect as a toner spray as it's an antibacterial, antiseptic & antimicrobial all in one. This is paired up with Juniper berry which is also an antiseptic and Grapefruit Juice to provide essential vitamins your face needs through the long harsh sunny days. The spray is strong (I use from an arms length away) but very much worth using as part of a daily routine. Now I may not be someone who has a lot of baths (mainly because Alice is in it all the time) but when I do Ickle Baby Bot is my go too bath bomb, so much so that this was one of my original posts. Containing Lavender and Aromatherapy oils, Ickle Baby bot is perfect to use in the warmer weather as it is designed to not be an irritant, making it perfect for delicate shin, but the Lavender is perfect to help if you've maybe been caught out in the sun for too long. Dream Cream is a hand and body lotion that contains Oat Milk and Cocoa Butter as it's main ingredients, meaning that it's perfect for anyone suffering from any type of skin problems. It helps to smooth and soften the area's of your body affected quickly and despite using both Oat Milk and Cocoa Butter, it's not too thick or creamy in the slightest. When applied on a morning and night basis, I've found that this has been the perfect product and has replaced my previous lotion. I'm going to be the first to admit that I love a good face mask and that it has to be one that hardens and that you can actually see working on your face. Don't Look At Me does exactly this and also works as an exfoliate at the same time. The Murumuru butter helps provide your face with the nourishment it needs on a day to day basis, the ground rice helps removed any dead skin and works well on blackheads and finally the combination of Lemon Juice, Tunisian Neroli, Rice Syrup & Grapefruit Juice helps to tone, brighten and soften skin. I've found that a lot of these products have been helpful during the recent heatwave and have helped my skin feel comfortable when everything else wasn't. 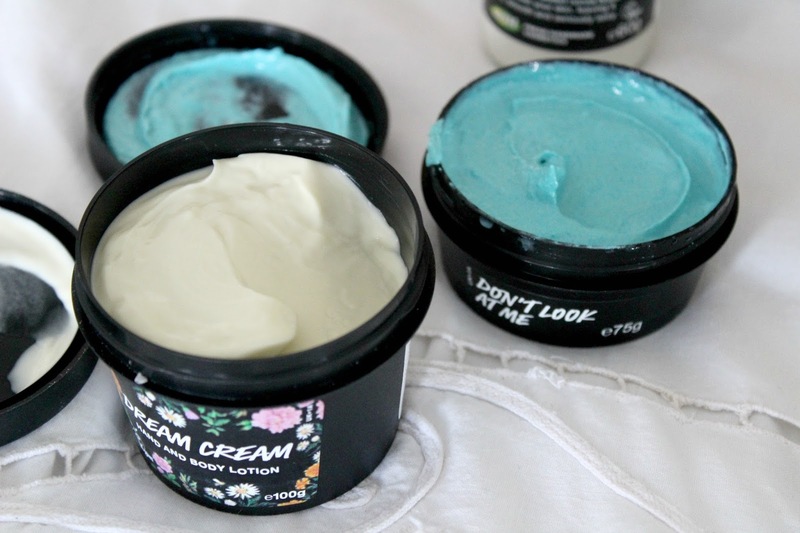 I'm highly likely to continue to pick up these products in the future but Lush very rarely seem to miss when it comes to their skin care products.